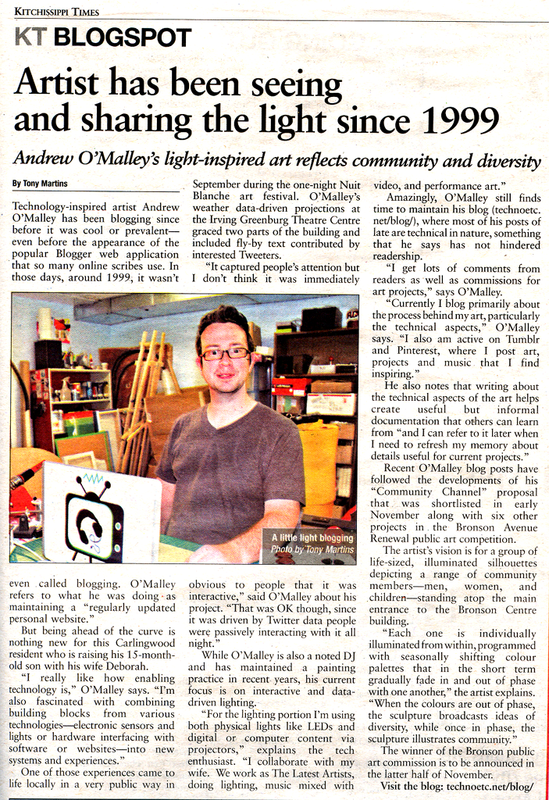 Local Ottawa newspaper, The Kitchissippi Times, interviewed me recently in a blogger profile. The interview saw me recalling that I’ve actually been blogging in some form or another since 1999! I started with a GeoCities site that had a “news” section that I regularly updated; next was a site that just had a news/event front page (on a beautifully tacky wooden background); then came Blogger, where I blogged about everyday observations and annoyances (how original!) . . . and after a hiatus I started the blog you’re reading now, focusing mostly on the technical side of my lighting art. Maybe one day I’ll dig up those old sites. In the meantime, though, you can peep the article below (click to expand), or open it as a PDF. It provides a nice overview of my artistic practice.